Space Box is a decent platformer, but its hook doesn't quite work. Let me say this up front: Space Box is a fantastic game. It’s challenging, fun, and has some really great mechanics and art. And if you have a set of virtual-reality goggles to plunk your iPhone into, you can even play it hands-free in 3-D using head-tracking controls. And that’s where it runs into some trouble, but you shouldn’t let it ruin the game for you. 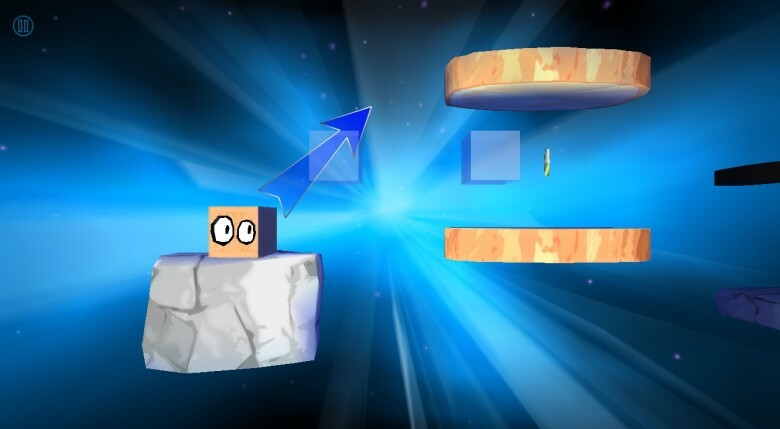 Space Box has you guiding a cute little cube with cartoon eyes across a series of platforms in the endless void of the cosmos. In the regular mode, you do this by dragging your finger anywhere on the screen to set the strength and direction of his leaps. It’s quick, clear, and it just works, and that’s good because space is dangerous, and eventually you’ll have to deal with some obstacles other than gravity and your own poor aim. First, you’ll face a time limit of sorts when the platforms start dropping the heck off into oblivion. But things get really interesting when you have to start rotating the entire screen to change perspective and reach areas on other planes. You do this by swiping down on the left or right side of the screen to rotate the world 90 degrees in those directions. And if you’re a perfectionist, Space Box also gives you crystals and stars to pick up along the way for perfect runs. The stars unlock additional levels, and the crystals give you extra tries if (when) you fall. You’ll start to hit trouble when you try the hands-free mode, however. The mechanics are the same, but instead of dragging on the screen — an impossibility when your iPhone is strapped to your face — you’ll look at the box to select it, and then move your head to set the jump. The main issue is that this is slower than the hands-on version, which really becomes a problem when the things you’re supposed to be standing on start tumbling out from under you. And we all like to complain about ads in mobile games, but they reach a new level of annoyance when they start playing between levels and after some of your missed jumps. They wouldn’t be a huge issue if you didn’t have to take your phone out of your headset to tap the button to close them. And that gets old really fast. The permanent solution is to make the $2.99 in-app purchase to remove ads, but you should do that because you want to support the developer and not because the ads are so horribly implemented. Regardless, it’s easy to recommend Space Box, but the ads and slightly slower controls make its killer feature a hard sell. Space Box is available in the App Store for free.